AdrenaLinn Sync is sunk, it would seem. With its great-sounding filters, inspirational rhythmic effects and excellent modulation features, Roger Linn's AdrenaLinn Sync - a sort-of plugin version of his AdrenaLinn III pedal - has been a favourite among guitarists and other musicians for several years now. As of a couple of days ago, however, it is no more - at least as far as new users are concerned. Roger Linn has announced that he'll no longer be selling AndrenaLinn Sync, citing problems with 64-bit support and increasing copy protection costs as the reasons. In a statement on the Roger Linn website, he says: "As of April 22, 2015, I (Roger) am no longer selling AdrenaLinn Sync. Why? First, I've been waiting three years for our development partner Way Out Ware to deliver a working 64-bit AU version that can be installed in Mac OS Yosemite, but it appears they are not capable of finishing it. "Second, our copy protection provider has informed us that they are more than tripling their annual fee to $5,000, which is much more than we earn from sales of AdrenaLinn Sync. So I give up. "If you own a license for AdrenaLinn Sync, your existing installations will continue to work fine but I'm sorry to report that after May 10, 2016, you won't be able to install AdrenaLinn Sync on a new computer. 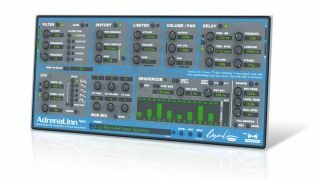 It's a shame because I think AdrenaLinn Sync is a very inspiring musical processor." A shame indeed. Is it too much to hope that some kind of solution can be found and AdrenaLinn Sync can live on?